Standard WMS can generate static maps only. There is a number of use cases in which generating an animation is of interest. An obvious case is time-based animation. Other uses include elevation-based animation, varying the values of SQL View or SLD substitution parameters, or the changing the extent of the generated map to produce the appearance of a moving viewport. This capability is provided by the WMS Animator. The WMS Animator works in a similar way to the WMS Reflector. It uses a provided partial WMS request as a template, and the animator parameters are used to generate and execute a sequence of complete requests. The rendered map images are combined into a single output image (in a format that supports multi-frame images). aparam specifies the name of the parameter that will be changed in the request for each frame. This can be any WMS parameter such as layers, cql_filter, bbox, style and so on. Nested parameters (such as required by the format_options, env and view_params parameters), are supported using the syntax of param:name (for example, view_params:year). The Animator parses the input values and uses string replacement to generate the sequence of WMS requests to be executed. Each generated request is executed to produce one frame. 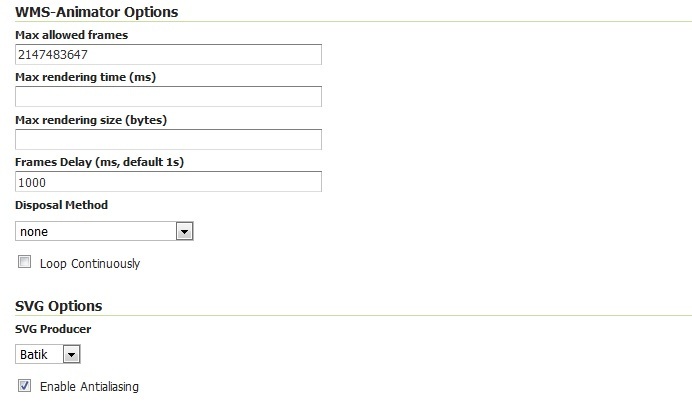 It is up to the caller to ensure the provided animation parameters result in valid WMS requests. To invoke the WMS Animator specify the path wms/animate instead of wms in a GetMap request. layers: This is the only mandatory standard parameter. It is a comma-separated list of the layers to be included in the output map. width: Describes the width of the image. It defaults to 512 pixels, and can be calculated based on the specified height and the aspect ratio of the bounding box. height: Describes the height of the image. It can be calculated based on the specified width and the aspect ratio of the bounding box. bbox: Specifies the extent of the map frame. The default bounding box is determined by taking the union of the bounds of the specified layers. (For example, if one layer shows Los Angeles and another shows New York, the default map shows most of the United States. The bounding box also determines the aspect ratio of the map. If only one of width or height is specified, the other is determined based on the aspect ratio of the bounding box. styles: The default value is the default styles configured in GeoServer for the layers specified in the layers parameter. This can be overridden by providing a comma-separated list of style names (which must be known to the server). srs: If all layers share the same SRS, this is used as the default value. Otherwise, the default value is EPSG:4326 (WGS84). gif_loop_continuously If true the animation will loop continuously. The default is false. gif_frames_delay Specifies the frame delay in milliseconds. The default is 1000 ms.
gif_disposal Specifies what to do with the previous GIF frame once a new frame is displayed. Valid values are none, doNotDispose, backgroundColor and previous. The default is none. The first three options set server limits on the animation output. It is possible to set the maximum number of frames an animation can contain, the maximum rendering time to produce an animation and the maximum size of the whole animation. The default animation frame delay (expressed in ms) looping behaviour and disposal method can be set as well. These values can be overridden by using the format_options parameter as described above.